1. Spa La La started with therapeutic heat packs and has expanded to robes, wraps, and loungewear. The Aroma Eye Pillow in paisley silk is filled with French lavender and organic flaxseed for scented relaxation, and its patterned sleep mask blocks out unwanted light for a deep sleep. 2. Lingerie designer Mary Green offers these silk satin sleep masks. 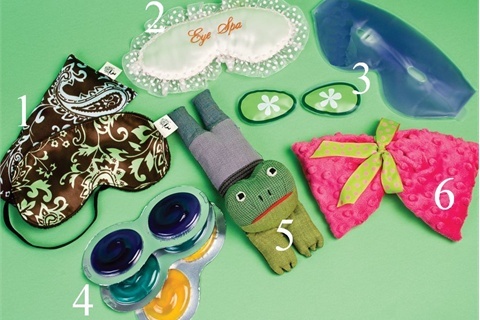 Masks have embroidered or rhinestoned sayings for travel, napping, and nighttime. Some are reversible or embellished with lace, embroidered animals, or prints. 3. Spa Sister offers products for creating a spa-like experience in the home and has a celebrity following. These Gel Eye Masks can be used hot to help relieve congested nasal passages and allergy discomforts, or cold to help alleviate headache tension and stimulate blood flow. 4. Igels, offered by makeup company DuWop, are discs of cool gel that conform to the shape of the eye, bathing the area with botanical extracts and lessening dark circles and fine lines. Each pouch of igels comes with three bold colors, reusable up to four times each. 5. This Recycled Patchwork Eye Pillow from The Animal Rescue Site is cute, eco-friendly, and fairly traded. Made in Nepal with local recycled materials, these come in three whimsical animal shapes: cat, dog, and frog. 6. Sonoma Lavender’s Happy Hour Spa Masks can be heated in a microwave or towel warmer to relax eyes and relieve headaches. Filled with lavender and flaxseed for hot or cold therapy, these spa masks are available in other designs as well.